Darth Sunshine: Color Inspiration #32 Challenge! My first!!! Color Inspiration #32 Challenge! My first!!! I used the Wondrous Gift stamp set, Red Riding Hood, Metallic Gold, Very Vanilla CS, Gold Embossing Powder, White Taffeta Ribbon and Gold cord...all from Stampin Up! **Sorry this is a duplicate post--I had some issues with my original post--I couldn't enlarge my picture when I clicked on it. Even my computer programmer hubby told me it was blogger's software that was messing with me. ROFL!!! *sigh* Anywhoo--I hope you like! Love that tree, it's stunning! 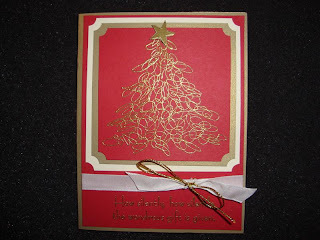 love your embossing and the use of colors - beautiful! 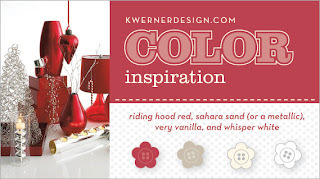 I'm a Color Inspiration Newbie!